Your gut may play a pivotal role in preventing the onset of Parkinson's disease. And the reason may be its knack for sleuthing. Researchers at the University of Iowa have found that the gut may be key to preventing Parkinson's disease. Cells located in the intestine spark an immune response that protects nerve cells, or neurons, against damage connected with Parkinson's disease. Acting like detectives, the immune intestinal cells identify damaged machinery within neurons and discard the defective parts. That action ultimately preserves neurons whose impairment or death is known to cause Parkinson's. "We think somehow the gut is protecting neurons," says Veena Prahlad, assistant professor in biology at the UI and corresponding author on the paper published Aug. 30 in the journal Cell Reports. Parkinson's disease is a brain disorder that erodes motor control and balance over time. It affects some 500,000 people in the U.S., according to the National Institutes of Health. The disease occurs when neurons–nerve cells–in the brain that control movement become impaired or die. Normally, these neurons produce dopamine, and when they are damaged or killed, the resulting dopamine shortage causes the motor-control problems associated with the disease. Scientists have previously linked Parkinson's to defects in mitochondria, the energy-producing machinery found in every human cell. Why and how mitochondrial defects affect neurons remain a mystery. Some think the impaired mitochondria starve neurons of energy; others believe they produce a neuron-harming molecule. Whatever the answer, damaged mitochondria have been linked to other nervous disorders as well, including ALS and Alzheimer's, and researchers want to understand why. Prahlad's team exposed roundworms to a poison called rotenone, which researchers know kills neurons whose death is linked to Parkinson's. 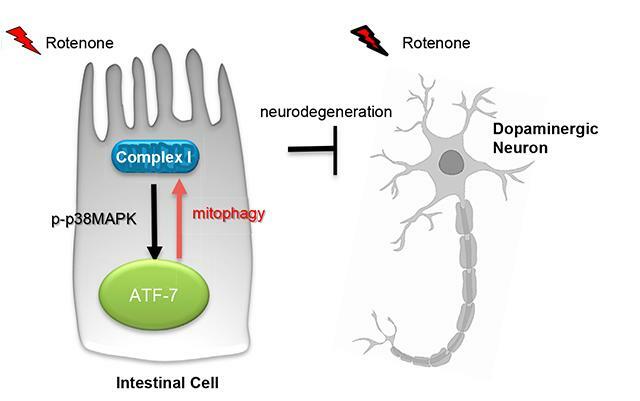 As expected, the rotenone began damaging the mitochondria in the worms' neurons. To the researchers' surprise, though, the damaged mitochondria did not kill all of the worms' dopamine-producing neurons; in fact, over a series of trials, an average of only seven percent of the worms, roughly 210 out of 3,000, lost dopamine-producing neurons when given the poison. "That seemed intriguing, and we wondered whether there was some innate mechanism to protect the animal from the rotenone," Prahlad says. It turns out there was. The roundworms' immune defenses, activated when the rotenone was introduced, discarded many of the defected mitochondria, halting a sequence that would've led to the loss of dopamine-producing neurons. Importantly, the immune response originated in the intestine, not the nervous system. "If we can understand how this is done in the roundworm, we can understand how this may happen in mammals," Prahlad says. The researchers plan to conduct more experiments, but they've got some interesting hypotheses. One is the intestinal immune cells are, according to Prahlad, "constantly surveilling mitochondria for defects." Even more, those cellular watchdogs may be keeping their eyes on the mitochondria "because they don't trust them," Prahlad suggests. The reason has to do with the prevailing theory that mitochondria originated independently as a type of bacterium and were only later incorporated into the cells of animal, plants, and fungi as an energy producer. If that theory is correct, the intestinal immune responders may be especially sensitive to changes in mitochondrial function not only for its potential damaging effects, but because of the mitochondria's ancient and foreign past as well. "How it's happening is suggestive of the possibility that the innate immune response is constantly checking its mitochondria," Prahlad says, "perhaps because of the bacterial origin of the mitochondria." The paper is titled, "The Mitochondria-Regulated Immune Pathway Activated in the C. elegans Intestine Is Neuroprotective." The first author is Madhusudana Rao Chikka, who was a postdoctoral researcher at the UI during the study and who helped design and execute the experiments. Contributing authors, all from UI's biology department, include Charumathi Anbalagan, Katherine Dvorak, and Kyle Dombeck. The nonprofit Ellison Medical Foundation funded the study.